Website of the Month October 2017 – Wellyracks! We’re pleased to announce the Website of the Month winner for October 2017 – Wellyracks! 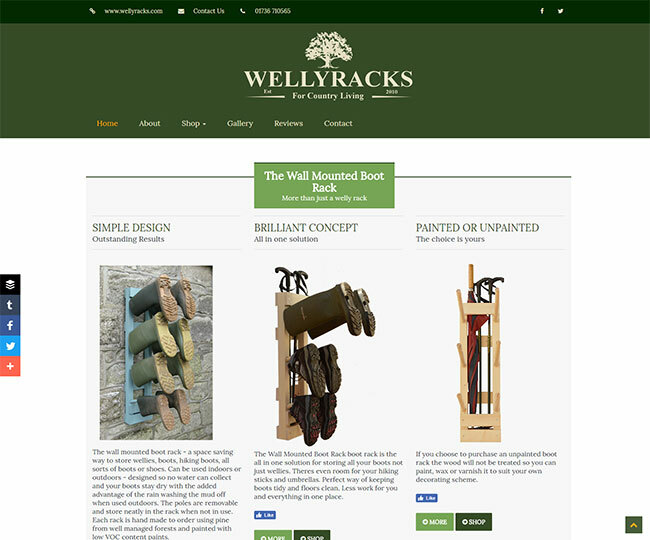 WellyRacks creates – you’ve got it – welly racks. Based in Perranuthnoe, Cornwall, the family-run business takes a custom approach to manufacturing. And customisation isn’t just limited to variations in pole sizes and colours. WellyRacks’ online presence is tailored with equal consideration to the requirements of site visitors. User optimisation takes centre-stage with key information, imagery and reviews laced together with strong calls to action and social media integration. WellyRacks keeps on racking up the awards. Previously the proud winners of Theo Paphitis’ #SBS Business Award and of the highly regarded Twitter hastag #QueenOf for welly storage, WellyRack also now joins prestigious line-up of Heart Internet Website of the Month winners. 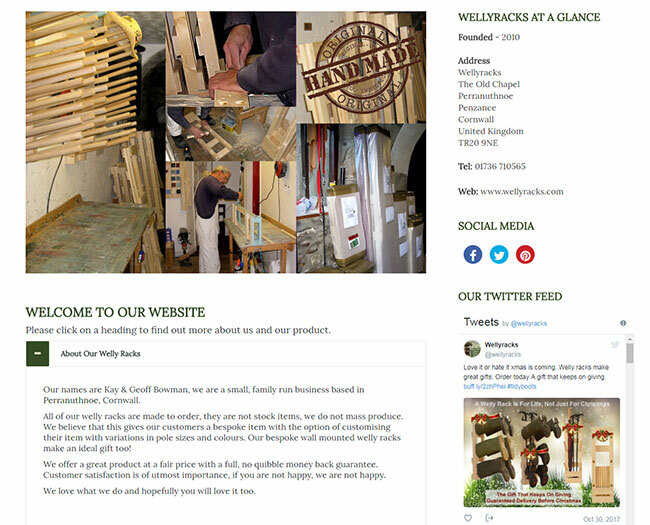 We talked to Kay Bowman, owner of Wellyracks, about her website. We hand-make wooden wall-mounted wellington boot racks. They are designed to be space saving, keeping boots off the floor and out of the way – freeing up space in the hall, porch, or anywhere boots tend to gather in messy muddy piles. 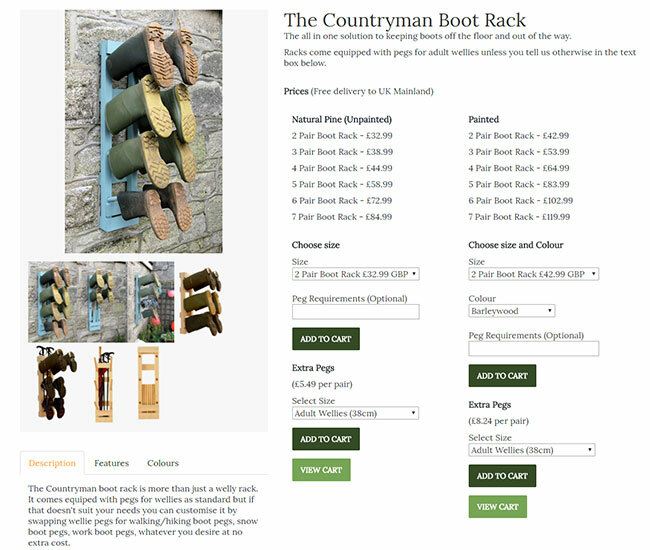 The best part is that they are not just for boots – each rack can be custom-designed to accommodate welly boots, walking boots, snow boots, work boots, children’s wellies, anything really, and at no extra cost to the customer. The poles are even removable and store neatly in the rack when not in use. they are available painted or unpainted and the price includes delivery to mainland UK! How does your site support and drive your business goals? 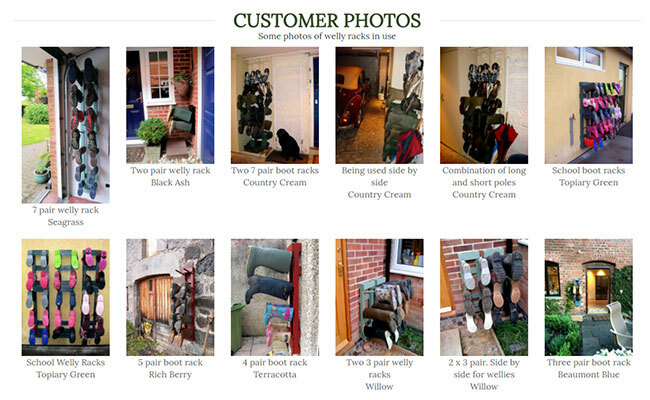 The website gives prospective customers the chance to find out everything they need to know about our welly racks, see lots of customer photos of our product in use, and then place an order or contact us if they need to know more. We ask for feedback on our product, which gives us a chance to improve upon anything that may need it and go forward with the business rather than stand still. I believe the website is friendly and professional at the same time. At least, I hope it is! When you designed the website, did you design with the customer in mind or did you have a fixed idea on how you wanted to portray the brand via the website? When I designed the website, I definitely had the customer in mind. I wanted to make it as easy to navigate as possible, making sure all the information was available at a click of a button. The colours and the fact that it works well on mobiles. What do you think makes your website different from the competition? There is plenty of information and it’s easy to navigate. Do you have any future plans for the website? Yes, I’m planning on having a commenting system, where customers can comment on our product and/or website right there on the page rather than sending us an email. And how has it been being a Heart Internet customer? My experience as a Heart Internet customer has been absolutely great. They have always come up to expectations. If I ever have a problem, whether it’s with part of a design not working or any other issue, they have always helped me out in a timely and professional way. I have no hesitation at all in recommending them to others and do so often. Thanks, Kay! Congratulations on your lovely website and winning! If you think you could be the next Website of the Month, visit our Website of the Month Facebook post and submit your site! Please see our previous post for further details.